Turkey's Treasury and Finance Minister Berat Albayrak, left, and France's Finance Minister Bruno Le Maire make declarations to the media at the ministry in Paris, France, Aug. 27, 2018. Turkey warned on Monday that U.S. trade sanctions against it could destabilize the Middle East and ultimately bolster terrorism and the refugee crisis, underscoring the regional impact of Ankara's deepening rift with Washington. Turkish Finance Minister Berat Albayrak, who is President Recep Tayyip Erdogan's son-in-law, used a visit to Paris to both take aim at the United States and highlight Ankara's push for better ties with Europe, given the standoff with Washington. "These steps taken with political motivation will not only impact the global financial system but also global trade and regional stability," Albayrak told a news conference following a meeting with his French counterpart, Bruno Le Maire. "With the damage [the measures] will cause to regional stability, they will unfortunately contribute to chaotic problems that feed terrorism and also the refugee crisis." "The exchange rate sensitivity created by the tension between us and the United States continues," said Seda Yalcinkaya Ozer, an analyst at brokerage Integral. Turkey and the United States are also at odds over diverging interests in Syria and U.S. objections to Ankara's ambition to buy Russian defense systems. The United States has expressed concern that NATO member Turkey's planned deployment of the Russian-made S-400 could risk the security of some U.S.-made weapons and other technology used by Turkey, including the F-35 jet. A committee from the U.S. Congress visited Turkey on Monday and held meetings with officials regarding the F-35 program, Turkey's foreign ministry said. 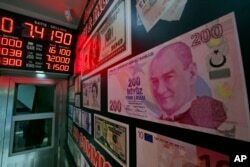 FILE - An oversized copy of a 200 Turkish lira banknote, featuring a photo of modern Turkey's founder Mustafa Kemal Ataturk, decorates a currency exchange shop in Istanbul. Turkey's central bank and banking watchdog have taken steps to underpin the lira in recent weeks, including cutting limits for Turkish banks' swap transactions. On Monday, the Istanbul stock exchange said it had started work on setting up a swap market as part of efforts to make the city an international finance center. Investors remain concerned about the lira, given Erdogan's opposition to high interest rates and with inflation near 16 percent in July, its highest in more than 14 years. Erdogan has cast the lira slide as the result of an "economic war" against Turkey, a comment echoed by his spokesman last week when Trump ruled out concessions to Ankara in return for Brunson's release. The main BIST 100 share index was up 1.22 percent at Monday's close. The yield on the benchmark 10-year bond dipped to 21.95 percent from 21.98 percent a week earlier.